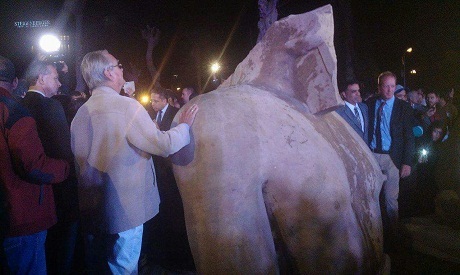 Minister of Antiquities Khaled El-Enany said on Thursday that the royal colossus discovered last week in Matariya district, Cairo is probably a statue of 26 dynasty king Psammetich I not King Ramses II as believed earlier. Hieroglyphic signs and initial studies carried out on fragments of the colossus suggest that it belongs to king Psammetich I(664-610 BC)-26 Dynasty, El-Enany said. The minister explains that the torso’s back-pillar has preserved one of the five names of king Psammetich I. "If it belongs to this king, then it is the largest statue of the Late Period that was ever discovered in Egypt," he said. This date explains the puzzling features of different ancient stylistic details since the Late Period, which is known for its archaizing art. Dietrich Raue, the head of the German archaeological mission which participated in the discovery mission, pointed out that the colossal statue is carved in quartzite which was hailed from from Al-Gebel Al-Ahmar in what is now modern eastern Cairo. The statue originally measured about 9 meters in height. The two fragments of the statue were discovered under the water table, which made their location and extraction extremely difficult, Raue explains. The fragments were found adjacent to a heavily congested housing area, two to three meters beneath water levels. Mahmoud Afifi, the head of the Ancient Egyptian Sector at the ministry, explains that both fragments were moved and successfully saved by a team of the ministry's restorers and archaeologists from Matariya Antiquities Inspectorate and skilled workmen from Qift. Both parts and a collection of recently discovered artifacts in Matariya were transported today - with the help of the Transportation Department of Egypt’s Armed Forces - to the Egyptian Museum in Tahrir for restoration and temporary exhibition. It will be later tranferred to its permanent home at the Grand Egyptian Museum (GEM), which scheduled for a soft opening in mid-2018. Aymen Ashmawi, the head of the Egyptian mission, said the artifact that is on show with the fragments of the royal colossus includes a relief of King Ramses II. It features King Ramses II with an extended right arm, performing the ritual of anointing the representation of the cult-statue of a goddess. The goddess can be identified by other blocks from this area as Mut. This relief was found in the remains of a second temple of King Ramses II. The temple of Matariya is well known as one of the most important sites of pharaonic religion, since it was considered to be the place of the world`s creation by the sun-god. For about 2400 years, most kings erected their monuments in the temple. Because of the vicinity's proximity to modern Cairo, the site was heavily destroyed in antiquity, from the Late Roman times onwards to the Mameluk era in medieval times. The blocks of the temple were used to build various monuments in Old Cairo such as Bab el-Nasr and others. More monuments could be found in Matariya.